As a private citizen, a member of Congress and in the Indiana statehouse, Gov. Pence has rejected recognizing that lesbian, gay, bisexual and transgender people are equal under the law and under standards of human decency. 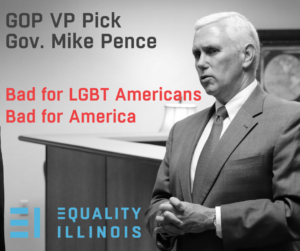 Pence opposed federal HIV funding, he supported “gay conversion” therapy, he opposed marriage equality, and he promoted state-sanctioned LGBT discrimination.